After the detection of a movement, the motion detectors enter a pause mode of 5 min. During the pause, the LED doesn't light up and new alarms can not be given. If a new movement is detected during the pause, this mode is prolonged for another 5 min. The pause mode ends as soon as no movement is detected for the period of 5 min. For router passwords you cannot use SPACE (empty character) or inverted commas.For camera passwords only numbers 0 to 9 and letters a to z or A to Z can be used (not ä, ö, ü, ß for example). When trying to set up access from another mobile device: The access cannot be set up as during the initial setup. Set up the access as desribed in section 9.2. of the manual. "Search in LAN": Camera and mobile device are not connected to the same WLAN router. Connect the mobile device to the same WLAN router as the camera. The camera is not powered. Check that the Power LED on the corresponding camera lights. If not, check the mains adapter and cable connections. The reason can be a strong lightsource shining into the camera lens. Move the camera to another location. The reason can be overexposure due to strong light source. Change the direction or location of the camera. The camera is out of WiFi range. Reduce the distance between camera and WiFi router or use a WiFi repeater. The radio link was interrupted by objects. Remove large objects or change the location of camera. The antenna is not upright. Align the antenna upright. The WiFi router is not connected to the internet or is not powered. Turn the router on and connect to internet. The Smartphione / tablet is not connected to WiFi /internet. Connect the smartphone / tablet with WiFi / internet. The SSID is not open. Select open SSID. The DHCP is not activated on the WiFi router. Activate DHCP on the WiFi router. The WPA/WPA2/WPA2-PSK encryption is not activated on the WiFi. Activate WPA/WPA2/WPA2-PSK2 encryption on the WiFi router. The sensitivity of motion detection is set too high. Set the sensitivity to lower. The microSD card is not fitted or not formatted / the used card is not Class 10 card. Insert a microSD card and format it / use a Class 10 card. The Automatic recording and/or motion detection is turned off. Switch the automatic recording and/or motion detection on again (see manual chapter 9.). The sensitivity of the motion detection is set too low. Set the sensitivity to higher. The movement occurs outside the coverage area. Align the camera accordingly. The time zone setting is not correct. Search over a longer period and set the right time zone. On Android, data are saved automatically in "Own Files\DCIM\OMGuard Lite", and on iOS only directly in the app's album. For Android: Search in "Own Files". The image file has not been updated. Update the file, activate a mediascan or restart the mobile device. A new version of the app is available. Download the latest app version or perform an app update. These variations are caused by the infrared function which unfortunately cannot be changed. The recording is still in progress. Please wait until the recording is finished. The software has crashed. Download the new software (see manual chapter 9) if available. Yes, it is. Please proceed as follows: Download "Advanced IP Scanner" on your PC and open the software. Adapt the IP searching area to 192.168.178.1 - 192.168.178.555 to find the camera. Click on "scan" and wait until "Neotune Information Technology Corporation, LTD" is mentioned in the result list. Open the IP address by double click in the dropdown menu. Subsequently, your browser opens. Enter your unser name (admin) and camera password. After that, choose "Image Steam Mode" in the next window. Your camera image appears now. In case you can't view the camera image, change the compatibility settings of your browser. Please use the app "OMGuard HD". In case you still use "OMGuard", please change to "OMGuard HD". In your router settings, standards B+G must be set. If only the Wireless-N-Standard is set, you have to change to „mixed mode“ (the denomination can vary from manufacturer to manufacturer). This means that not only the Wireless-N-Standard but also B+G need to be selected (i.e. B+G+N). As the AC50 does only support B+G, it should then be able to connect to WiFi. Moreover, one of the channels 1-9 must be set; please be careful with auto settings of your WLAN router - they might lead to connectivity issues. To access the settings, tap the „Advanced“ field. Enter your Admin password (default password 123456) and confirm with „OK“. Note: The transmission rate of the pictures depends on the quality of the WLAN connection between camera and router as well as between router and smartphone. Please make sure that you have inserted a microSD card. Please also make sure that you have selected „high“(for higher sensitivity of the motion detection) in the Sensitivity Setting. In case „off“ is selected, there will be no automatic recording (see manual chapter 9 and 12). Please make sure that you have downloaded the current version of the app. The camera housing itself is weather-proof (IP66). However, humidity might enter if the rubber strap remains open when installing the SD card and at the same time there is a high air humidity. If condensed water has developed, the camera needs to be operated with opened rubber strap for about 1 hour. Afterwards, the rubber strap can be closed again. To prevent condensed water formation, please make sure the camera is always supplied with electricity when installed outside. It may occur that the infrared filter is stuck, i.e. it is not drawn back at night time. This means that the picture remains dark although the IR-LEDs light up. Normally, this problem can be solved by carefully knocking on the housing or pulling out the power plug. For Android devices:In the App, tap the information button (see picture). Among others, the menu item „notify“ appears in which you can activate the setting „notify enable“. 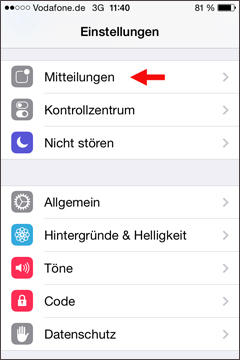 For iOS devices:Tap the button „notifications“ in the general settings and select the app OMGuard from the list. The desired type of push notification can then be activated. You can find the DID on the lable at the bottom side of the camera. The app OMGuard is not supported any more. Please download the new app OMGuard HD. You can now enter your prefered e-mail address as mail recipient. The Gmail address is only needed as a sender address. The camera AC60 transmits on a wireless channel between 1 and 9. A router transmits on a channel between 1 and 13. Please choose a channel between 1 and 9. This problem occurs when the name of your router contains a space character. Please change the name of your router. Please use an SD card with up to 32GB, class 10, and no UHS cards in order to prevent technical problems. The camera AC70 transmits on a wireless channel between 1 and 9. A router transmits on a channel between 1 and 13. Please choose a channel between 1 and 9. If your camera ist oversaturated due to direct light, please select "outdoor" instead of "indoor" as environment mode in the advanced settings. In general, the camera sends push messages with an alarm interval of 2 min meaning that if a push message is sent after motion detection, the next message will be sent at the earliest 2 min after the previous message, even if another movement is detected within this time slot (the recording function remains unaffected).Besides, a push message schedule might be activated. In this case, push messages are only sent within the set time. The number of smartphones is unlimited, but the number of smartpnhones that can access at the same time is limited to 3. If the AVT700 is used within a system 700, the system occupies one address. In this case, 2 smartphones can access the AVT700 at the same time. Check that the spring on the tamper switch on the back of the control unit is depressed. If this is not depressed the unit will not alarm. The unit is possibly not yet armed because you are still in the detection area. The unit allows you minimum 30 seconds to leave the room / the detection area. If during this time a movement is detected the exit delay of 30 seconds starts again. A detection during the exit delay is signalled by a peep sound and a flash of the red LED. When the green LED goes out the system is fully armed. Check that you have waited for the exit delay (min. 30 seconds) and the entry delay (8 seconds after detection). Check by moving across the detection area of the PIR movement detector, do not move directly towards the PIR movement detector. Check that the batteries are still good. Check that the spring of the tamper switch on the back of the control unit is depressed. Arm the control unit - the green LED illuminates to signal the exit delay period. Every detected movement will be signalled by a flash of the red LED and a peep sound. When you have walked around to check the detection area then you can disarm the system. When no movement is detected during a period of 30 seconds, then the system is fully armed. If this happens you should quickly disarm the system. The person or object is not moving enough or too slowly. The temperature of the person or object is too close to the ambient temperature. The movement must be across the detection area. Movements directly towards the PIR movement detector are not detected as quickly. A radiator, heater, air conditioner, fan, coffee maker, fax machine or similar switching on or off. Remove any potential disturbing factors or change the location of the PIR movement detector. Under standard conditions (around 20°C) the detector can cover an area of approx. 90° to a distance of up to 6m. It is recommended that the PIR movement detector be mounted in a corner of the room such that the expected movement is across the detection area. The maximum range can vary with high or low temperatures and humidity. Test the detection area, holding the PIR movement detector in the proposed location, before you start with the installation. The external siren and the siren in the control unit sound for up to 60 seconds. You can interrupt the siren by disarming the system. If the system is not disarmed the siren will stop automatically after 60 seconds. The system remains armed: If further movement is detected the alarm will be repeated. Whenever the batteries are removed the code (as well as other programming) will revert to the original factory settings. Try using the factory set code of "11". If this works, then you can reprogram your own code (refer the user manual). Of course you are free to use the factory set code (11). However, we strongly recommend using a different code for security reasons. Under normal use alkaline batteries will last over one year. If the batteries in the control unit need to be changed, this will be indicated by a peep sound and a short flash of the red LED every 20 seconds. If you are not regularly in the protected building we recommend that you change the batteries once a year. Always change the batteries in the external siren and the control unit at the same time. The control unit and the PIR movement detector are designed for use indoors (or inside smaller buildings such as garden sheds and garages). The external siren can be mounted outdoors, it should however be protected from direct rainfall (mount it beneath a roof overhang for example). The external siren and the control panel have become disconnected. There is no power in the control panel. Maybe the batteries in the control panel are run down or have been removed. The batteries are used up. Replace the batteries in the control unit and in the external siren with new ones. After the battery change remember to reset your code. In order to remove the device from the ceiling, push it into the direction of the power supply (at one side of the device) until you can hear a "click". In full screen mode, the incorrect channel is selected. Select the desired camera. The camera is not powered. Check that the Power LED [23, see manual] on the corresponding camera lights. If not, check the mains adapter and cable connection. The camera and monitor are not paired. Pair camera and monitor. The camera is out of range. Use an antenna extension cable (see manual chapter 18) Reduce the distance between camera and receiver. Objects are preventing the wireless connection. Remove large objects or change the location of camera and/or receiver. The antenne is not firmly attatched or both are not parallel to each other. Connect the antenna  tightly and position both antennas parallel to each other, eg. both vertical. The camera channel is not activated. Activate the required camera channel. Monitor and camera are too far apart. Reduce the distance between camera and monitor. The antennas are not parallel. Position the antennas parallel to each other. The wireless connection is blocked. Remove objects, in particular metallic objects and/or change the locationof camera and/or monitor. There's an interference with the wireless signal. Check that there are no interference sources near camera and receiver egWLAN Router, elektrical produvts, Microwave ovens. The battery is discharged. Connect the mains adapter. The camera channels are not activatedd or have no connection. Pleasesee the points "The camera image does not appear on the screen" and "The wireless reception is unstable" above. Insert a readable and unlocked micro SD-card and format it. There's an overexposure due to a strong light source. Change the direction or location of the camera. There ist a strong lightsource shining into the camera lens. Move the camera to another location. The micro SD-card is locked. Unlock the micro SD-card.The micro SD-card is full. Format the micro SD-card (see manual chapter 12: ) or activate the overwrite function. This can be due to motion from trees or plants, light or shadow, snow or rain etc. Reduce the sensitivity of the motion detection or change the position of the camera. The software hangs. Carry out a reset (see manual chapter “Reset”). In full screen mode, probably the incorrect channel is selected. Select the desired camera. The camera is not powered. Check that the Power LED [16, see manual] on the corresponding camera lights. If not, check the mains adapter and cable connection. The camera is out of range. Use an antenna extension cable (see manual, chapter 17) or reduce the distance between camera and receiver. Objects are preventing wireless connection. Remove large objects or change the location of camera and/or receiver. The antenna is not firmly attatched or both are not parallel to each other. Connect the antenna [28, see manual] tightly and position both antennas parallel to each other, eg. both vertical. Monitor and camera too far apart. Reduce the distance between camera and monitor. The power safe mode is selected. Press the on/off button or turn off the Power safe mode (see manual chapter 12). The camera channel has not been selected or the cameras have no connection. See points "The camera image does not appear on the screen" and "The wireless reception is unstable" above. There's no SD card inserted. Insert a readable and unlocked SD card and format it. The SD card is locked. Unlock the SD card. Probably the touch screen auto-lock is enabled. Tap the On/off button or disable the Touch screen auto-lock (see manual chapter 12). The reason could be motion from trees or plants, light or shadow, snow or rain etc. Reduce the sensitivity of the motion detection or change the position of the camera. Activate the push notification (see manual chapter 14). 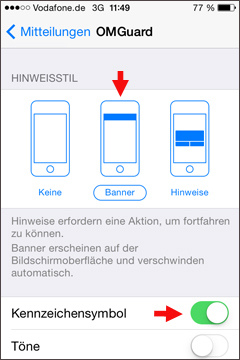 Acitvate the display of notifications on your mobile device under settings/message (iOS) or apps (Android). The corresponding storage is not connected with the smart recorder. Connect the storage with the smart recorder. The incorrect camera or camera channel has been selected or the selected camera or camera channel has no recordings. Select the correct camera or camera channel. The mobile device is not connected with the internet. Please connect your mobile device with the internet. The camera channel is not activated. Activate the desired camera channel (see manual chapter 12.3). The camera is not powered. Check that the Power LED on the corresponding camera lights. If not, check the mains adapter and cable connection. The camera is not paired with the smart recorder. Pair camera and smart recorder. The camera is out of range. Use an antenna extension cable (see manual chapter 17) or reduce the distance between camera and smart recorder. Objects are preventing the wireless connection. Remove large objects or change the location of cameras and/or smart recorder. The antenna is not firmly attatched or both are not parallel to each other. Connect the antennas tightly and position both parallel to each other, eg. both vertical. The incorrect signal input is selected on the TV / monitor. Select „HDMI“ as signal input on the TV/monitor. Smart recorder and camera are too far apart. Reduce the distance between camera and smart recorder. The wireless connection is blocked. Remove objects, in particular metallic objects and/or change the location of camera and/or monitor. There's an interference with the wireless signal. Check that there are no interference sources near camera and smart recorder e.g. WLAN router, electrical products, microwave ovens. The power safe mode is selected. Click the mouse once or switch the energy saving mode (see manual chapter 12.3). Cameras are not activated or have no connection. See faults "The camera image does not appear on the screen", " The wireless reception is unstable", "The monitor picture switches of automatically" above. With an iphone, the app can only be displayed in the landscape format. You can turn to a portrait format with ipad or Android devices only. The SD card is locked. Unlock the SD-card. The reason can be motion from trees or plants, light or shadow, snow or rain etc. Deselect or reduce the sensitivity of the motion detection through pixel change, or reposition the camera (see manual chapter 12.3). For a proper functioning, USB sticks should not be used with the recorder. Instead, you can use a micro SD card or an external hard disk with separate power supply. The smart recorder is not connected with the router. Connect the smart recorder with the router. The router is not (yet) connected with the Internet. Connect the router with the Internet (takes approx. 30 seconds). Your internet connection is not fast enough. You need a data speed of 1.5Mbps per user connection. Maximum 3 users can access the recorder at the same time. DHCP is not activated on the router. Activate DHCP on the router. UPnP is not activated on the router. Activate UPnP on the router (if necessary, activate UDP or open TCP Port #600 and #80). The mobile device is not connected with the Internet. Connect your mobile device with the Internet. Your mobile device is not compatible with the requirements for the app. The requirements are: iPhone4S corresponds to current iPad: from iOS6.14; Android dual core 1.5 G Smartphone/Tablet from 3.0. The incorrect DID (device ID) has been entered. Enter the correct DID (see manual chapter 14). The cameras have not been activated in the settings. Activate the cameras in the settings (see manual chapter 12.3). The cameras have not been activated during the registration of the set in the app. Activte the cameras in the registration settings of the set (see manual chapter 14). The password has been changed. Enter the new password. The main menu is opened in the screen menu or another mobile device is accessing the settings. Close the screen menu or the setting page of the mobile device. Has the protective foil in the battery compartment been completely removed? Have the batteries been inserted correctly (refer to marking in the battery compartment)? Are the batteries run down? Do the batteries make good electrical contact? > remove them, check that they are clean and reinsert them. Is the ON/OFF switch on the "I" (ON) position? Is the window open (is the magnet far enough from the Alarm unit)? The distance between the magnet and the Alarm unit is too large. The distance must be less than 10 mm. The arrow on the magnet must point to the mark on the side of the Alarm unit. Yes. It is however, not recommended for the main entrance door of a house or flat when you are absent, as you yourself will cause an alarm on leaving and entering the property. Yes. 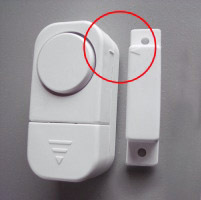 However if you position the mini alarm on the inside, you yourself will cause an alarm when you open the door or drawer. Reduce the distance between the magnet and the Alarm unit. Insert a wooden or plastic spacer under the magnet and if necessary under the Alarm unit in order to separate them from the metal surface. Use a plastic or wooden spacer under the magnet or alarm unit to reduce the distance. Mount the magnet on the side of the opening window frame (see the picture below). The batteries are used up. Insert new batteries. Observe polarity when inserting. The arrow on the magnet must point to the mark on the side of the Alarm unit when the window is closed. 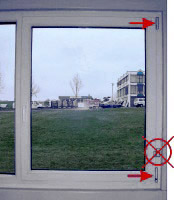 The distance between the magnet and the Alarm unit must be less than 10 mm when the window is closed. 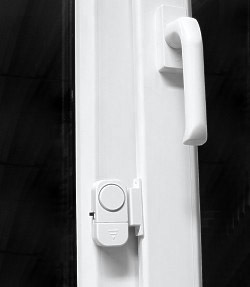 The distance between the magnet and the Alarm unit must increase to over 20 mm when the window is opened. Yes, to a limited extend depending on the size and design. Mount the unit on the bottom of the window frame (European style windows). Make sure that in the tilted position an alarm is not already caused. 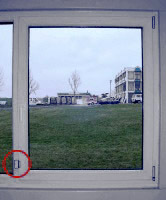 Make sure that when the window is tilted that nobody can reach the ON/OFF switch from outside. The alarm will continue until the window is closed, until the unit is turned off or until the battery becomes exhausted. It depends on how often an alarm is sounded. On average the batteries will last about a year. Cut carefully through the adhesive pads with a knife. Then remove the remainder of the pads. Is the switching key turned to ON position? The arrow on the magnet must be opposite the arrow on the alarm unit (left or right side). The arrows must be pointing to each other. The distance between the magnet and the alarm unit must not exceed 10mm when the door is closed. The door must be opened to activate the alarm. Are all the batteries the right way round? You have 12 seconds to open the door. The alarm is activated only when the door is closed again. The door alarm is controlled by a microprocessor. The times are fixed and cannot be changed. The selected mode is only active when the unit is switched on again. Turn the key to the OFF position and then to the ON position. The batteries are run down. Insert new batteries and check their polarity. What does that mean? The flashing green light means that an alarm was triggered and not switched off with the key. The flashing red LED means that the batteries are run down. Insert new batteries and check their polarity. Reduce the distance between the magnet and the door alarm. Place a wooden or plastic spacer under the magnet and, if necessary, under the door alarm, to separate it from the metal surface. Mount the magnet to the side of the door and the magnet to the door frame. Place wooden or plastic spacers under the magnet or alarm unit. Check first of all that the plug of the power cable is connected to a mains power supply. Is the mains power available at the socket (is the socket switched on)? Check the two-core wire connection between the outdoor station and the indoor station. Is the two-core wire connection cable correctly connected? If you have used an existing cable, check the function of the Door-Intercom using the 9m cable provided. 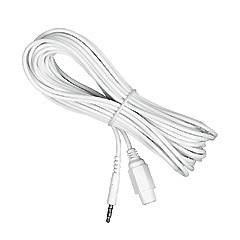 If the Door-Intercom functions using this cable, then you must check the existing cable. The connection of the two-core connecting wire is incorrect. Swap the position of the wires at the terminals of the indoor station. Check if the microphone of the outdoor station is covered. Check if the indoor and outdoor stations are too close together. This can cause acoustic feedback. Check that there are no electrical appliances near the outdoor or indoor station. If there are, remove these. Check that there are no high voltage cables running alongside, or crossing the connecting wire. If there are, then separate these. Yes, you can use an existing doorbell cable. You must however observe the cable cross section and maximum length. You can find these in the instruction manual. Connect the cable and test the door intercom before you install the units. Yes, if you use the correct cable and make sure the connections are well made. In addition to the two-core cable for the audio connection, another two cores are required if you wish to control an electric door release. You must observe the cable cross section and the maximum length. These are stated in the instruction manual. Test the functioning of the door release from the indoor station before final installation. 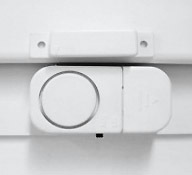 Use an electric door release which is suitable for your door. Observe that the door release must operate with 12 V DC (maximum 1A current drain). The power supply for the door release is provided from the indoor station, you do not require any additional transformer. 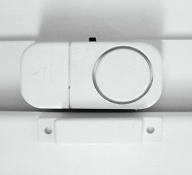 The connection of the door release is not polarity dependent. No, it is not compatible with any other systems. No, this is not possible any more. When the power supply of the DVT20 external unit is interrupted and restored again, it starts to ring. Please check your power supply. The reason for your problem could be a power failure. 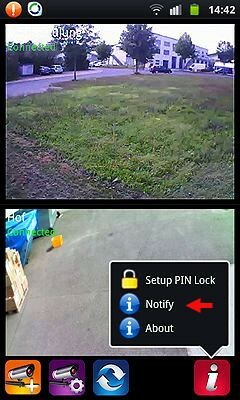 The Outdoor station /optional additional camera has no power. Check the mains adapter, cable connections and batteries. The devices are not paired with each other. See chapter 13.2 in the manual. The stations / the camera are too far apart. Reduce the distance between the devices. The wireless connection is blocked. Remove large objects or change the location of the stations. The antenna is not fixed tightly, or antennae not parallel to each other. Screw the antenna tight and position the antennae parallel, eg. Vertical. There is an interference with the wireless signal. Remove sources of interference from the devices, eg. WLAN router, LTE-Router, LTE-mobile devices Electrical appliances, radio transmitters, microwave ovens. The reason could be a strong light source in the camera view. Relocate the outdoor station / the camera. Probably an overexposure due to strong light source has occured. Relocate the outdoor station. The volume setting is too low. Adjust the volume setting on the indoor station. The outdoor station requires additional lighting to be able to display a good image. Install additional lighting. Your viewing angle of the monitor is unfavourable. Change the mounting height of the indoor station or adjust the monitor brightness. There is too much backlighting in the background. Install additional lighting or change the location of the outdoor station. The software has crashed. Please press the Reset button (, see manual) using a paperclip. Put your fingernail or another small item on the upper part of the card and press it downwards. The card thereby comes out of the slash. The sound of the camera DF270K is registered, but there is no sound at the monitor. If you push the talk button or ring the bell, two-way communication is possible: The sound is alternately transmitted from the external to the internal station and vice versa. (The sound of the DF270K can only be received live with the monitor DF270M). The contacts of the supplied battery are covered by a yellow protective foil. Please remove this foil before loading the mobile unit. Similar to other wireless devices, the EW01 reception is at a frequency of 2,4 GHz. Consequently, other devices can impact EW01. Please check your surroundings for devices transmitting at 2,4 GHz. This can be wireless weather stations, radio stations, wireless smoke detectors, wireless surveillance cameras, microwave ovens etc. After having detected the cause, please place the EW01 at the greatest possible distance from the interfering device and reduce the sensitivity until there is no interference any more. Even routers work on a 2,4 GHz basis. Check if your router is causing the barking by deactivating your WLAN. If the barking stops in this case, your WLAN is causing it. Please place your EW01 at the greatest possible distance from your router. In order to change the melody, please select the desired melody at the gong unit. Keep the volume button pressed for 5 seconds until a signal sounds and the LED light starts to blink rapidly. Now, press the bell button. You have changed the melody successfully. The gong unit confirms the successful teaching with the desired melody. Open the battery compartment of the movement detector FD2B. Remove the batteries to prevent a plate damage. Loosen the two screws of the housing with a screwdriver. Take off the housing cover. Flip the small switch with the number 2 (from "on" to "off") with the help of the screwdriver. Close the housing and fix the screws. Insert the batteries and start the device. The problem should be solved now. The button "on" and "off" only regulates the power supply of the batteries. Please pull the plug to switch the detector off. In order to change the melody, please select the desired melody at the gong unit. Keep the volume button pressed for 5 seconds until a signal sounds and the LED light starts to blink rapidly. Now, trigger the detector by a movement. You have changed the melody successfully. The gong unit confirms the successful teaching with the desired melody. No, the sound level is fixed. As many as you wish. The only limit is the transmission range. Simply purchase an additional set. The components are not available separately. The wireless chime operates in the 433 MHz frequency band. If you experience any problems with or due to other devices operating in this band then try changing the channel and/or relocating the respective devices. Yes, however the correct function depends on the batteries having sufficient capacity and charge. Therefore we recommend you use high quality batteries and to the charge frequently. Check that the same channel (1-16) is selected on the bell push and receiver. Check that the batteries are the right way around. Check that the receiver is within range. Try placing the receiver just a few metres away from the bell push. This is a sign that the batteries in the receiver are running down. Replace the batteries. Check the batteries and replace if necessary. Walls and metal objects (doors and door frames, fridges, kitchen appliances) shield and reflect radio waves. Other electrical appliances (in particular wireless devices) can interfere with transmission. Change the position of transmitter and/or receiver and/or remove the source of interference. Check that similar devices nearby are not using the same channel/code. Change the code as necessary. Terminals B and C should not be connected in parallel to an existing system. The bell push must be potential free. If you wish to continue using your existing doorbell system as well as the wireless chime, please connect to terminals A and C as shown in diagram below. Please check the wiring according to the instruction manual. If you have a DC system then check that the plus (+) wire (8-12V DC) is connected to terminal "C" of the transmitter and the minus (-) pole to terminal "A". The batteries in the transmitter (bell push) are always required. If your existing doorbell system uses less than 8 Volts DC then you will need to connect a small relay between the systems (see diagram below). Not unless your system has suitable output terminals (potential free or 8-12 V DC/AC). Is the socket live? Test with another appliance which you know works. Is the mains adapter pushed fully into the socket? Are the cable ends of the mains adapter connected to the terminal screws on the gas alarm? Once the power supply has been connected, an automatic self-test is carried out. The gas alarm emits several loud alarm signals. After a few seconds, the alarm will stop and the POWER LED will light up to indicate readiness for operation. The sensor is heated while the unit is on. For this reason it is normal that the unit is slightly warm. Depending on the type of gas, at the top or the bottom of the wall (see instruction manual). The lower explosive limit is the minimum gas concentration in the air which makes an explosion possible. The gas alarm is triggered when a gas concentration of approx. 5-6% of the lower explosive limit is reached. The alarm will sound as long as the gas concentration is higher than approx. 5-6% of the lower explosive limit. As soon as the gas concentration falls back to below this threshold, the alarm will stop automatically and the unit will return to its normal status. The sensor reacts to inflammable gases. An alarm may also be triggered by fumes from detergents, paint, varnish, sprays, cooking, tobacco or candles. The gas alarm must be operated with 12V DC. The required current of 150mA may be supplied by a car battery. Smaller batteries are not able to supply this amount of power. The gas alarm is intended for use in private households, where, under normal circumstances, no gas leak is expected. It is not authorised for the use in hazardous locations. Use a gas cigarette lighter (without the flame being lit!) to test the function of the gas alarm (see "Function test" in the instruction manual). After approx. 5 years of operation, the gas alarm should be replaced. No, there are special alarms for these types of gases. No, there are special alarms for CO and CO2. The odorising substance added to natural gas is designed to be smelt at very low concentrations, which can be below the alarm threshold of the gas alarm. Never try and test the gas alarm by using a gas appliance as there is a danger of explosion! Use a gas cigarette lighter as described in the instruction manual. If you smell gas or the alarm sounds at any time follow the instructions in the manual. It could be due to a low level of gas in the room which is not sufficient to set off the alarm. Check the function in another room where there is lots of fresh air. If the noise stops in fresh air, have your gas installation checked. For your safety the GA 617 has a diagnostic feature. Possible malfunction is indicated by simultaneous beeping noise together with blinking of the yellow fault LED. Please consult the user manual. The alarm signal of the glass breakage alarm can be followed directly by another alarm. In order to assure that the following alarm lasts 50 seconds, the electronic circuit has to be charged for approx. 1 minute after the first alarm. A new zinc-carbon battery should last one year. Good quality alkaline batteries can last 2-3 years. No. Rechargeable batteries have a lower voltage. The further away an object is, the smaller it will appear on the screen. For example. Mountains in the distance can be seen, but someone standing on the mountain will not be visible. The camera does not have any zoom function. The camera has an effective angle of vision of about 32°. Yes, however this is not recommended as there will probably be problems with reflections. At night, the infra-red LEDs from the camera will be reflected in the glass. The camera is weatherproof (IP 44) but not waterproof. Try and choose a mounting position which offers some protection against heavy rain falling directly on the camera. You can connect as many cameras as you have free AV-inputs. For example SCART inputs or Cinch (RCA) AV-inputs. You can also connect a camera to your video recorder. Yes, simply connect the camera to a SCART input on the video recorder and select that input on the recorder. 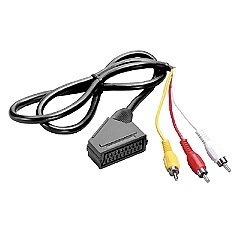 your computer has a composite-video input (for example on a TV-receiver board) then you can connect the camera using a SCART-cinch adapter*. If the video board has only an S-Video input then you will need an additional adapter from composite-video (cinch socket) to S-Video (mini-DIN plug). You can connect via a video recorder or use a SCART expander (Scart-switcher). Alternatively you can use a SCART-cinch adapter if you have cinch (RCA) inputs*. Is the plug fully inserted into the base of the camera (see diagramm below)? You should hear 3 distinct clicks as you insert it. Is the mains adapter connected properly? Have you selected the correct AV input on your TV or video recorder? Is the volume turned up to hear the sound? The camera needs light to function. If the area you are observing is very dark no picture will be visible. Only the area right in front of the camera will be illuminated by the built in infra-red LEDs. Lighting the area with normal lamps (for example halogen spot lamps) will improve the picture greatly. Yes, you can select between one and five times (see user manual). Yes, the dialler will always try to ring as many times as programmed. It will only stop if the alarm is disarmed. Yes, use a normal telephone extension cable. You can activate the "gong" function. Each detected movement will be confirmed by "ding dong" sound. Yes, the unit will respond to the panic button when even when the alarm is not armed. If you just wish to use external sensors, the PIR on the unit can be covered completely with one of the stickers supplied. Remove any such possible sources of false alarms from the field of view of the PIR, change the position of the unit or the direction the PIR is pointing. TIP: you can use the enclosed stickers to restrict the field of view of the PIR. Check that the dialling function is activated. If this symbol is visible in the LC-Display then the dialling function has been deactivated. The telephone number is incorrect or incomplete. There is no connection to the telephone line. Check that the telephone plugs are connected correctly. If you have an ISDN telephone connection, please note that the unit cannot be connected directly to the ISDN line (S0) but only via an analogue connection onto your telephone system. Your telephone system or socket is not wired correctly. Test the unit on a normal analogue telephone socket (without a telephone system) at a friend or relatives house. Some telephone systems require a short pause before the number to establish a dialling tone. Add one or more "pauses" as described in the user manual. If you normally have to dial a number to reach an outside line remember to include this. It may be necessary to include one or more "pauses" before and after this number. The settings may have been lost. Try the factory set code or carry out a reset to restore the factory settings. Carry out a reset to restore the factory settings. There is no back-up battery installed or it needs replacing. They hear an alarm siren. An individual message cannot be stored. No. Each remote control is individually coded. The code is "learnt" by the dialler in the factory. Insert the battery into the remote control. The MA80 must be disarmed (“ARM” must not be visible on the display). Open the cover of the connections compartment on the back of the main unit. Press the LEARN button (small white button in the left corner) with a pencil until you hear a beep. The MA80 main unit is now in the enrolment mode for 20 seconds. Press the “PANIC”-button on the remote control MA80R. A coded signal will be transmitted. The successful enrolment of the code will be confirmed with two long beeps. If the remote control is not enrolled within 20 seconds the enrolment mode will end automatically. This is indicated by 4 beeps. The dialler has lost the code of your remote control from its memory. Please re-learn the remote control into the dialler memory (see instructions below). It is possible to connect up to 8 wireless components (including the provided component). The triple beep indicates that 8 components have already been connected. It is therefore not possible to connect another component. It depends on how often the alarm or the light is used. If they are not used at all the batteries can last up to 3 years. With new batteries at least 15 one minute alarms can be given. The batteries are near the end of their life. You should replace it straight away. The pin is probably dirty. Please wipe it with a clean dry cloth. Check that the batteries are fitted the correct way. Use an additional ring or similar fixture to attach the alarm. You can use any suitable cord to extend it. Push the test button of the smoke detector for 16 seconds until the LED lights up permanently and starts to flicker. Release the button, the LED lights up permanently. Push the button two times within one second. The smoke detector confirms the deletion of the code with a beep. You have have activated the muting key of your smoke detector. During the mute mode (ca. 5 minutes), the smoke detector is beeping every 30s. After the stove alarm is installed, it needs to adjust to the kitchen environment. If the stove alarm starts to signal in a normal cooking situation, reset the alarm during the pre-alarm signal. This will cause the stove alarm to adjust its sensitivity. Test the alarm by pushing the push-button (see manual) until you hear a warning tone. If the stove alarm neither emits a tone nor flashes its light, the batteries may be flat. Replace the batteries (see "Battery replacement" in the manual). Set the sensitivity level to a more sensitive level (see "Manually setting the sensitivity level of the stove alarm" in the manual). The stove alarm does not always signal immediately in a hazardous situation. This is because it needs to take into account different cooking scenarios: if it would always signal immediately, too many false alarms would be triggered. If you would rather have the stove alarm to react earlier, increase the alarm's sensitivity by one or two levels (see "Manually setting the sensitivity level of the stove alarm" in the manual). If the device still doesn't work, ask your retailer. If the hob type has changed (e.g. from electric hob to gas hob), change the stove alarm hob type setting (see section "Operation" in the manual). The battery lasts for up to five years. Please find information concerning the battery replacement in your product manual. It is still possible to use the stove alarm. The stove alarm can also be installed on the wall using screws, at 40 cm height and at as central location as possible. Unfortunately the Stove Alarm is not suitable for these kinds of cookers. There can be a delay of up to 45 minutes before the SL02 turns the light off. The SL02 turns the light off approx. every 45 minutes to check if it is still dark. Yes, but only in a weatherproof lantern. Switch off the light and wait at least 15 seconds, then turn on the light again. If the light still does not work then check the bulb is OK. The command has not been accepted. Turn off for 15 seconds and try again (please follow the instructions in the manual exactly). On average the light will be on for about 80% of the time during the first half of the night. In the second half it will be on for about 20% of the time. No. The functions can only be activated by the ON-OFF-ON sequences. This cannot be simulated by a timer. No, If you have not operated the light switch the function remains active. Switching the light off deactivates the function. Important note: The latest firmware has to be loaded onto your gateway. If you don't use the latest firmware version, the functions can not be used in the full extent. In the settings under „firmware update“ you can check if your firmware is up-to-date and if updates are available. You can either connect the central unit to the router via network cable or via dlan/ powerline that permits to place the central unit wherever you like in your house. Yes, the system is still operating. The wireless components continue to communicate with the central unit. However, the app can only be used with WLAN connection. Alternatively, the system can be activated/ deactivated with the help of the wireless remote control. This problem is linked to the reaction time of the app. Please wait for 5 seconds until you connect with the central unit or when you control the system via app to guarantee that no background processes are running any more. A delayed reaction time has been selected for one or more movement detectors or door/window contacts and the detector has not been added to an activation scenario. Please select an input delay of 0 seconds (no input delay) and add the detector to a scenario. The covering material must not be too heavy or stiff, since the pressure mat reacts to points of pressure (no coconut mats or similar). As soon as there is pressure on the mat. However, if the mat stays pressed, no further signal is generated. Is the battery still functioning and has the correct polarity? Is the unit switched on (not to "0")? Is the cable connected correctly (is the plug inserted tightly) and is it not damaged? Press another part of the mat to check its functioning. Is the mat wet? If necessary, let it dry. Does the mat lie on an uneven surface? There must be no bumps in the mat. Are there any stones etc., on or under the mat? If the mat lies on an uneven surface or gets damp, the sensor may become too sensitive. In this case, even wind or draught can trigger the signal. Animals may trigger the signal. Switch off the pressure mat, if you do not need it . You may cut the cable and extend it by using a two-core cable. The total length must not exceed 30m. Please note: This leads to the expiry of all warranty claims. If the switch is in the "siren" position and the mat is pressed, an alarm sound can be heard for 30 seconds. The alarm can be interrupted by switching the switch to "0". If the switch stays in the "siren" position, the siren function is still active after the 30 seconds. If the mat is pressed once more, the alarm will sound for 30 seconds again. SPECIAL QUESTIONS ABOUT THE USE OF THE PRESSURE MAT AS A "CAT DOORBELL"
The mat must always be covered. Cover the pressure mat with a soft mat or a cloth your cat likes to sit on. No, the pressure mat is safe for cats. There is no radiation or other danger. Switch to the quiet setting or position the alarm unit further away from the door. All active pressure loads will trigger the acoustic signal. You should only switch on the unit when your cat is outside and you need the signal function. Here, a mistake has occured in the instruction manual. The buttons are generally not illuminated. The doorbell button does only light up if someone rings the doorbell. The power supply is interrupted. Check the power supply. The connection between the outdoor station and the indoor station has been interrupted. Check the connection and polarity. The cable is too long or its cross section is too small. Use a suitable cable (wire cross section at least 0,8 mm², max. length 70 m). The sound is produced by acoustic feedback. Place the indoor and the outdoor stations further apart from each other. The outdoor station needs additional light in order to be able to display a good image. Arrange additional lighting. Your viewing angle to the monitor is unfavourable. Change the mounting height of the indoor station or adjust the monitor brightness. There is too much backlighting in the background. Install additional lighting or change the installation location of the outdoor station. Please check whether the microphone of your outdoor station is polluted and if necessary, clean it by means of a paper clip or a compressed air spray. The electricity consumption in standby operation is approx. 0.5 W per monitor, i.e. 0.5 W for the VT36 and 0.1 W for the VT36/2. On the right side of the monitor, there is a colour regulator (see manual). You can adjust the colour of the display, i.e. change it from black-and-white to colour using the colour regulator. The electricity consumption in standby operation is approx. 0.5 W per monitor, i.e. 0.5 W for the VT37 and 0.1 W for the VT37/2. The water alarm registers fluids that are water based and conductive. It will not detect oil or fuels. Yes, up to 20 metres total length. Use a suitable two core cable (loudspeaker cable or bell wire). No. Rechargeable batteries have a lower voltage and will activate the battery warning after only a short period. Yes, the water alarm will continue to work for up to 21 days after the battery warning starts. The alarm will continue until the sensor is dry, until the unit is turned off or until the battery becomes exhausted. Mount the unit so that the lens is horizontal or slightly tilted downwards. In the horizontal mounting position movements across the protected area will be detected. Mount the unit so that the expected movement will be across the detection area. Mount the unit above the door. The protected area is now like a "curtain". When you decide where to position the alarm unit, take into account that such possible disturbances should not be in the field of view of the unit. They could cause an unwanted alarm. Check what disturbances could have caused this (see third question). If necessary change the location of the unit. On the temperature difference between the object / person and the surroundings. If there is a larger temperature difference the movement will be detected quicker. On the speed of the movement. Very slow movements will not be detected. On the direction of the movement (see first question). On the ambient temperature. At higher temperatures the maximum detection range and the sensitivity for detection of people will be reduced. No, the unit reacts to movement of heat sources to which it is directly exposed. If the unit is pointing towards a wall, curtain or window then it will react to the surface temperature of that material. It will not react to temperature changes behind these objects. Check first of all the battery. Try a new battery. Check that the battery is correctly connected and the contacts are pushed on fully. If you are using a mains adapter instead of a battery, check the voltage (9V DC) and the polarity (the inside of the connector should be + positive). If the switch is on position "0" the unit is switched off. Switch to position "Chime" or "Alarm". When you move the switch to position "Alarm" there is a 15 second delay before the detection is activated. When a movement has been detected whilst the alarm function is active, the siren will sound for 30 seconds. As long as the switch is on the "Alarm" position the alarm function remains active. If further movement is detected then the siren will sound again. The door bell function is independent of the switch position. The unit will always make the double sound when a door bell or other connected switch is activated.